Values and gaining an understanding of your key drivers and motivations matter. I know this because people keep telling me. Maybe not in specific values-related language, but certainly when they describe how they feel and what is happening at that time. Knowing your core purpose, why we make certain decisions and the influence of values impacts lives. They affect how we feel about our job, relationships and life in general. What is satisfying at work? What is frustrating? How relationships are going? The joys of a new friendship…or an old. Your ‘why’ influences all of these questions. It is when values align and we develop understanding of self and our motivations that genuine satisfaction and comfort is felt. Conversely, we are often at our most vulnerable and emotional when core values are being breached. Or, challenged when asked to compromise the things that matter the most. Values and purpose are often downplayed, both in concept and understanding. Core values are the guiding principles that dictate behaviour and action. Values facilitate self-awareness and help people to know what is right from wrong. They can help organisations to determine their direction and align business goals. They also create a sustained, unwavering and unchanging guide. It is this degree of self-awareness and self-acceptance that is central to personal and professional development. 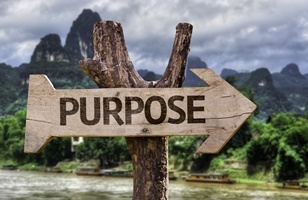 Taking time to reflect and understand what your purpose is, may be one way that you can learn to describe better influence and connect with others. Ensure that your team members, colleagues and friends can understand your perspective and decisions. Whether it is your boss, members of your team, spouse or peers, the opportunity to delve, understand and explain has great power. This type of conversation goes some way to breaking down the barriers that exist when we allow others to assume what is most important to us. Be clear about your purpose and ‘why’ and share this detail with those who matter most. Diversity and points of difference between people can be one of the most important drivers of individual and team success. But, only when the time is taken to improve self-awareness, learn more about other people and the best ways to work together. This rarely occurs without appropriate effort and focus. I have developed and facilitated workshops focusing on the theme of diversity, specifically the differences that naturally exist between people. Diversity has quickly become one of CoachStation’s most popular themes/programs, when working at group level or with individual clients being coached and mentored. Developing a core purpose, why and set of meaningful values is as important for teams as individuals. Articulating beliefs and reflective thoughts to people creates a potential common ground of words and language. It certainly provides clarity and opportunity for deeper and more authentic connection. Knowing your values connects with a deeper set of motivations. They help to understand why you make certain decisions, choices and drive your actions. Help people to help you by providing details about your purpose, values, beliefs and motivations. The alternative is to foster ambiguity and allow people to make assumptions about what matters most to you. Which would you prefer? Watch the CoachStation video clip below to learn more about values and their influence on your life. This entry was posted in CoachStation, Emotional Intelligence, Leadership, Purpose, Self-Awareness, Values and tagged Coaching, CoachStation, Leadership, Leadership Development, Purpose, Self-Awareness, Steve Riddle, Values, Why. Bookmark the permalink.